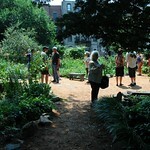 The Garden of Union, lying between 4th and 5th Avenues on Union Street in Park Slope, is composed of two small public gardens mainly focused on the aesthetic and practical uses of edible plants. Food waste drop off is offered daily, spring through fall, from 10:00 AM - 2:00 PM. 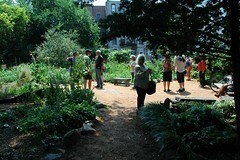 In addition to the array of edible and ornamental flora, the garden has a rock garden, meditation shrine, and a small fishpond.